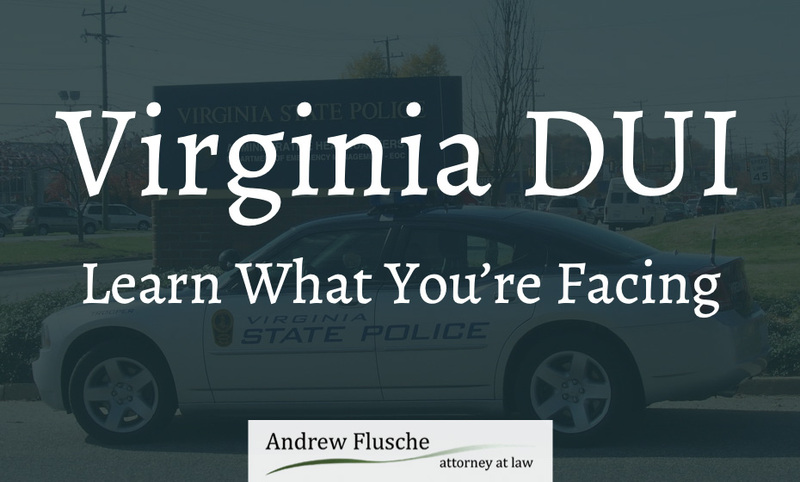 The information contained here was written by experienced Virginia DUI attorney Andrew Flusche and was last updated in March of 2019. Are you facing a DUI charge in Virginia? If so, I am sure you are worried about what you could be facing. Let’s take a look at the facts. In Virginia, driving under the influence occurs when you drive or operate any motor vehicle while your blood alcohol concentration is 0.08 percent or higher. Virginia Code § 18.2-266 makes DUI / DWI a class 1 misdemeanor, which is a significant criminal charge. Potential penalties for a first offense DUI in Virginia include, a fine of up to $2,500, a jail sentence of up to 12 months, and a license suspension of up to 12 months. If you have been charged with a DUI in Virginia, I am here to help. Please don’t hesitate me to discuss your defense. If I am unable to help you, I will refer to you a qualified attorney in your area who can. Keep reading for answers to your most pressing questions about your Virginia DUI charge. What are the penalties for DUI in Virginia? How do I get my license back before trial? 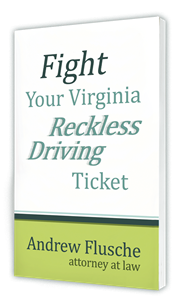 Can I get my Virginia DUI reduced to “wet reckless”? What if the officer doesn’t have video? Can we win if the officer didn’t read me my rights? Will I be able to drive to work? The biggest factor in determining jail time for a DUI is what your blood alcohol content is proven to be. In Virginia, if you’re found guilty of a first offense Virginia DUI and the blood alcohol is .15 to .20, the law requires that the judge gives you at least 5 days of jail. If your blood alcohol content was over .20, the law requires at least 10 days jail. If your blood alcohol was below .15, there is no mandatory jail. If you’re found guilty of DUI in Virginia, you’ll have to do VASAP – Virginia Alcohol Safety Action Program. There’s, unfortunately, no way around this requirement if you’re convicted, even if the DUI was only for prescription medication! Some courts might not require VASAP upon pain of going to jail; however, you would have to complete VASAP to clear your license with Virginia DMV. VASAP is normally a minimum of 10 weeks of classes – two hours per class. Depending upon your record and substance abuse history, you may have to do additional things such as therapy and AA meetings. Jail is definitely one of the top questions people have about their Virginia DUI charge. Are you going to jail, and if so, how much time might you get? Even setting aside the mandatory jail due to your blood alcohol content, you can still get jail – or more jail than the mandatory minimum. One big factor around Fredericksburg that can give you jail time is if your case involved an auto accident. Some prosecutors push hard for jail in those cases. If you are charged with Virginia DUI, you will have a 7-day suspension of your license for a first offense – or a 60-day suspension for a second offense. After the pre-trial suspension is over, you should be able to pick your license up in person at the clerk’s office. They will sometimes mail it to you as well. If the clerks don’t have your license or it gets lost in the mail, you can request a re-issue of your license from Virginia DMV. Many clients understand that they may not beat their case completely, but they’re trying to see if they can at least get a break from a DUI conviction. Lots of websites and online forums talk about getting a Virginia DUI reduced to a “wet reckless” outcome to achieve exactly that goal. A “wet reckless” is a slang term for convicting you of reckless driving but adding punishments such as VASAP and license suspension because you were originally charged with DUI. Unfortunately, this isn’t usually possible in the courts around Fredericksburg, Stafford, Spotsylvania, King George, and Caroline. In the courts where I practice, the prosecutors normally want a DUI conviction if they can prove it. To try to avoid the DUI, we normally have to fight the case head on. Many people are used to shows like CSI and Law & Order where video and other physical evidence are often used to prove the state’s case. Unfortunately, real criminal cases aren’t usually based on the video. In most Virginia DUI cases, there will be no video. Many cruisers aren’t equipped with video, and they often malfunction. Also, sometimes the video is angled in a way that you’re not even on it. The lack of video does NOT help us. In fact, I believe that it often hurts the defense. Most judges lean toward believing whatever the law enforcement officers say in court, so they don’t need the video to establish their case. However, video can help us to show that the facts aren’t as bad as they might sound – and sometimes the officer might be completely mistaken in his testimony. But if there’s no video, we won’t have a way to demonstrate that. Your Miranda rights or “warnings” are only required if you are being interrogated while in custody. And then, the remedy for not reading your rights to you is that any answers you give are not admissible in court. How does this apply to a Virginia DUI? Usually, the police will get all the evidence they need for their case before you’re actually in custody. They ask you about where you’re coming from, what you drank, when your last drink was, etc. Then they have you do field sobriety tests and the handheld breath test. Only after all that are you normally placed into custody. That’s when your Miranda rights should be read to you. But if the officer forgets to read your rights to you, there may not be any harm to the Commonwealth’s case. The only remaining evidence they usually need after your arrest is to prove your blood alcohol content, and Miranda doesn’t really apply to that test. With that said, there are some cases where the officer continues to ask questions after you’re arrested. If they haven’t read your rights to you, then we can hopefully exclude any answers that you gave. If you are found guilty of first offense DUI, Virginia law requires that your Virginia license (or privilege to drive in Virginia) is suspended for one year. The good news is that in most courts you’d be immediately eligible for a restricted driver’s license to let you drive for work, school, childcare, church, etc. You would have to install an ignition interlock on whatever vehicle you’re driving for the first six months, but at least you’d be able to drive. A second offense DUI conviction in Virginia makes it more difficult to get to work. Your license would have to be suspended for 3 years. Depending upon how long ago your first offense was, you’d be able to get a restricted license after 4 or 12 months. You might be walking for a year. DUI and DWI are basically interchangeable slang terms for the same basic offense: Operating an engine under the influence of something. People often ask me what the difference is between DWI and DUI in Virginia. Frankly, there isn’t any difference in my opinion. They are both just slang terms for the same thing. Virginia law, under section 18.2-266, prohibits operating a motor vehicle–any kind of engine, or even a train–if you’re under the influence of drugs or alcohol, or any kind of substance that alters your abilities to drive or operate the vehicle safely. So it’s a very broad statute. It covers the operation of just about any kind of engine, under pretty much any circumstances, when your abilities are impaired. That could be due to alcohol, which is most common, it could be due to drugs such as marijuana, or it could be due to medicine your doctor gave you. Even a prescription medicine could be a DUI. Why do we call them DUI or DWI? Frankly, I use the term DUI just because it’s easier to say. DWI is a bit more cumbersome, so I just call it DUI. The Virginia courts, on your paperwork, if you’re charged with a violation under 18.2-266, typically write DWI. What that stands for is Driving While Intoxicated, so that’s usually an alcohol charge. However, like I said, the statute covers basically driving under the influence of just about anything, so that’s where DUI comes from: Driving Under the Influence. So if you have a drug charge for example, there is actually another acronym you might see called DUID, which is Driving Under the Influence of Drugs. But as you can see, it’s all under the same statute. It’s all prohibiting operating an engine while under the influence of something. That’s why I typically just refer to all in shorthand as DUI and many attorneys and defendants do as well. There is really no distinction. DUI, DWI, it’s all the same type of charge, and it’s really the same offense. There are different little things the commonwealth may have to prove, such as what actually was in your system, but in every case, they have to prove operation, and that you were actually under the influence of something. So no matter what it’s called, DUI or DWI, it’s certainly a serious charge and you’re still facing the same penalties, which would be a one-year loss of license, depending on the actual case, perhaps some jail and that kind of thing. So you definitely want to talk with an experienced DUI/DWI attorney about your case.